Recent events are clearly indicating we are approaching another Demand Destruction moment like the one witnessed in 2008 which triggered the current recession after an oil price spike reached the $145 per barrel level. This time though the results could be much more devastating considering that we have an already weakened economic scenario and that recent turmoil in the Middle East and beyond are jeopardizing our geopolitical stability. Furthermore in 2008 we had not reached yet peak oil while according to all estimates we are now past it or just on it and this will make a huge difference. Saudi Arabia has been targeted in the last week as a cheater on the real entity of its oil reserves and its capacity to be able to contain the spiraling of oil prices. If energy prices linger at such elevated levels, the next domino will be heightened inflationary pressures around the world, but particularly in the emerging markets. Central bankers in Brazil, Russia, India, and China (the “BRIC” countries) are already wrestling with runaway food prices. Surging energy prices are likely to trigger even tighter monetary policy decisions in the near term. The hawkish European Central Bank could even be convinced to move toward a rate hike as well. But of all the economies impacted by higher energy prices, China may be in the worst position. Recently, China surpassed Japan as not only the second largest economy in the world, but also the second largest consumer of oil in the world. The possibility of a sustained, dramatic increase in energy prices should finally convince the People’s Bank of China that it has a significant inflation problem and is meaningfully behind the policy response curve. With inflation already at 4.9 percent but real interest rates at -1.9 percent, China is facing the triumvirate of price pressures: food, wages, and now energy. The real question is who is going to win in all this mayhem well the answer is simple. After all these dominos fall, global investors will likely find themselves in a world that looks like this: the Middle East is highly unstable, emerging market economies are slowing, and the crisis in Europe has been exasperated by shrinking exports, leading to a decline in the value of the euro. Against this landscape, the U.S. economy and dollar-denominated financial assets will look increasingly attractive on a relative value basis. 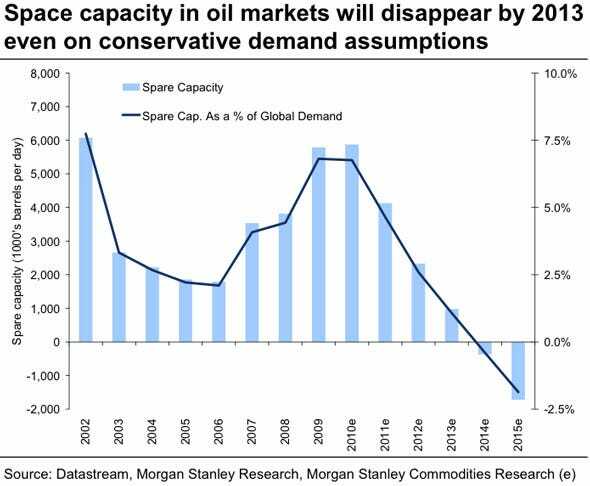 The situation though will not improve with time and as many analysts have already said the way from this point forward is only downward, Morgan Stanley recently published the following chart showing how spare capacity will develop in the following years as you can see SPARE capacity will practically disappear by 2013. The only way to kick the can down the road and earn few more years of hedonism and consumerism is to create a destruction of the demand as the one occurred in 2008, you bring the economy back in recession demand for oil goes down and you save some time before facing the inevitable shortages and loss of living standards. We are trying to slow down the avalanche but sooner rather than later we will be reached and swept by it.